Specialized Bikes, a worldwide brand for performance road and mountain bicycles, approached our agency, to help promote an onsite buy one, get one road tire campaign called Let’s Go Dutch. 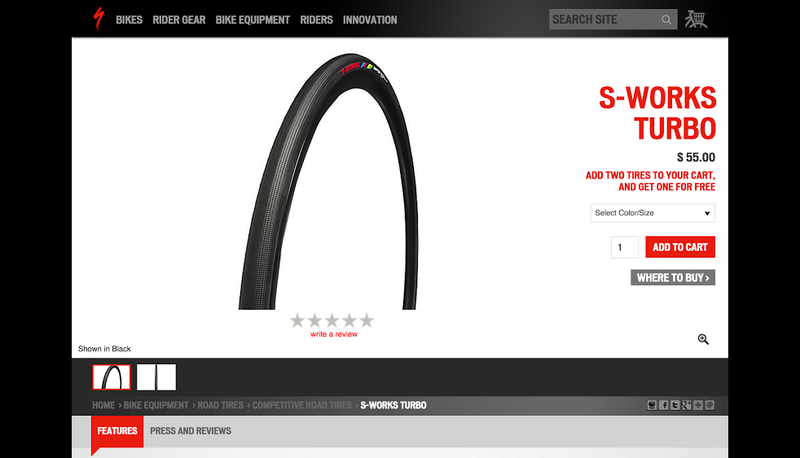 In addition to A/B testing promotional content messaging through Optimizely, we identified an opportunity to serve personalized content to previously interested road tire shoppers on the site. Given limited internal dev resources for this promotion, as well as abbreviated project timelines, roboboogie stepped in to make nimble changes on their site; serving messaging and hosting site changes through the Optimizely dashboard. In the two months leading up to the campaign, the roboboogie team collected a personalization target list by setting up a ghost experience to determine which users were actively looking for tires. Users who met the criteria under that experiment were added to a custom audience in Optimizely. The users who made it into this audience then saw a unique promotional content bar during the final BOGO campaign, giving them extra visibility into road tire deals. Utilizing Optimizely as not only a test tool, but to push content as a CMS allowed the team to promote and implement tested messaging on appropriate road tires, instructing users on how to participate in the sale on the campaign tire pages on mobile and desktop nimbly, without the assistance of an occupied Specialized development team. The strategic messaging addition boosted add to carts by 11.4 percent on desktop and 7.3 percent on mobile. Personalization efforts boosted add to carts by 18.1%, and overall site sales by 21.4%. Revenue generated through personalization experimentation alone has provided more than four times the monthly combined cost of Optimizely platform and roboboogie agency services. And most importantly, a happy Specialized team, excited about ramping up personalization efforts due to impact of personalization efforts with the Let’s Go Dutch campaign. Learn more about roboboogie’s target marketing and personalziation services here.